In what's becoming a typical theme, the Gran Tourismo Daytona (GTD) Class once again comprises the largest amounts 'O entrants, with this year's cache being 21, vs. last year's Gynormous tally of 30. The biggest News for this year's GTD (Daytona) Class is that true Bonafied "Works" Teams, i.e. ; Factory efforts are not allowed this season, as apparently Acura and Lexus were "Grandfathered" in for 2017. And with a reported 21-entries Pre-Roar Before', I'll not attempt covering every single Bloody entry, (in detail) especially since they'll be somewhat fluid up to Raceday. Instead I'll just cover some of the various efforts that peaked my Attenzione, with NO Disrespect to anybody left out. (3) Acura, (2) Audi, (1) BMW, (4) Ferrari, (3) Lamborghini, (2) Lexus, (3) Mercedes and (3) Porsche. 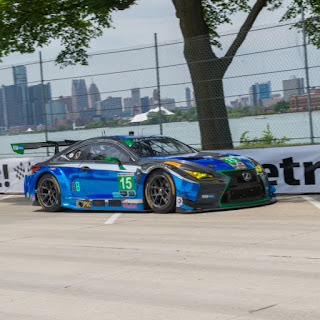 Michael Shank Racing, (MSR) along with Lexus's 3GT Racing Squads have lost their "Works" (Manufacture) status this year, as the IMSA has made the transition to fully Customer based competition in this mushrooming "showroom Stock" GT category. The Seester' #93 pairs Lawson Aschenbach and Mario Farnbacher, presumably the "Pro" Drivers with the unheard of for Mwah tandem of Justin Marks and Come Ledogar. Reportedly Aschenbach & Marks will contest the full season aboard the No. 93 while the No. 86 will just contest the four North American Endurance Cup (NAEC) events this season, as MSR also will be busy running a partial IndyCar campaign with Schmidt Peterson Motorsports and Jack Harvey as Thar driver. Meanwhile, a brand new third NSX will take the green flag, with Honda of America Race Team's (HART) #69. With team leader Chad Gilsinger and Ryan Eversley being joined by reigning ELMS LMP3 Champions Shawn Rayhall & John Falb, who drive for United Autosports, who are, Uhm? running that Fernando Cat; Ariva-Ariva-Ariva! Defending Two Times consecutive IMSA GTD Class champion Scuderia Corsa returns with revamped lineups, as Alessandro Balzan has a new team-mate this season. Cooper MacNeil Will join Balzan in the #63 Prancing Horse for the entire season, carrying Weathertech sponsorship. And veteran Sports Car Aces Gunnar Jeannette and Jeffrey Segal will help out with the driving chores at Daytona. Sam Bird, who ran with Scuderia Corsa last year, is effectively joined by last year's Alex Job Racing's (AJR) #23 trio of (Townsend) T' Bell, Bill Sweedler and Frankie Montecalvo - who'll co-pilot the team's #64 entry. As Sweedler and Bell won the North American Endurance Cup previously for Scuderia Corsa, whilst unfortunately Alex Job has curtailed his long standing stint of IMSA competition and is now focusing upon Historic Racing customers instead. The No. 51 Spirit of Race team from Switzerland is making their second outing at Daytona, and features a Stout lineup with ex-Formula One's Pedro Lamy and Mathias Lauda, son of triple F1 world champion "Niki-the-Rat." Along with Oh KanaDuhs' Paul Dalla Lana, who comprised three quarters of last year's Factory Aston Martin Racing's #98 Drivers. As the only one missing this year is Marco Sorensen, who's replaced by Daniel Serra, with Aston Martin being another casualty of the "Works Teams" Manufacturers Ban. Risi Competizione apparently is covering it's bases in the IMSA GT landscape by running one Prancing Horse apiece in the two classes, i.e. ; GTD & GTLM. And will run it's familiar #82 of la Quattro Mexicali's and one Irishman; No Jokes! The other B-I-G' News leading up to this year's Roar Before was the legendous' Scotty "Scooter" Pruett announcing his impending retirement following this year's Rolex 24 after 50 years of racing. Pruett, along with co-drivers Union' Jack Hawksworth of past IndyCar fame, David Heinemeier Hansson and Dominik Farnbacher will chauffer the No. 15 mount. Meanwhile the team's famed No. 14 Seester' entry will see another name from the past on its Driver's Roll, with Whiney Bags' Bruno Junky' Junqueira returning to action, having previously raced for RSR's Jaguar Squad. While the rest of his co-driver's are all unknown to Mwah. Dane' Femme Fatal Christina Nielsen, the other half of Scuderia Corsa's Defending GTD Class champions has moved to rival Porsche and a new team for this year. As Nielsen will be partnered by Patrick Long, America's only Factory Porsche Driver aboard the #58 Wright Motorsports entry for the full season. While Porsche young standout Mathieu Jaminet and Robert Renauer join for Daytona. the No. 59 Manthey Racing and No. 73 Park Place Motorsports return for another go at Daytona with their ubiquitous Porsche 911 Panzerwagons; Ja Volt! Park Place Motorsports Driver lineup is intact from last year with the exception of Matt McMurry graduating to Prototypes with the #90 Spirit of Daytona Racing this year, being replaced by Tim Pappas. Audi returns with a brace of its R8 LMS chassis, propelled by a 5.2-litre normally aspirated V-10 lump. The #29 Montaplast by Land-Motorsport, which also contested last year's Rolex 24 returns. And longtime Porsche 911 entrant Magnus Racing returns to competition with its familiar No. 44, spearheaded by Andy Lally, who drove one of Mike Shank's Acura NXS's last season. As Lally's co-drivers include a name from the past, Marcus Winkelhock, who shocked us all by briefly leading the 2007 European Grand Prix in a lowly Spyker F1 car! As Spyker gambled on the formation lap and switched Winkelhock to intermediate rubber as the German was starting last. Yet as the skies opened up at the famed Nurburgring, and the grid was forced to pit to change from Dry Rubber, Winkelhock vaulted to P1, where he stayed for six laps - before ultimately retiring from Hydraulics failure in his one and only formula 1 race. Thar' should be Tres Lamborghini Huracan GT3's, utilizing the same 5.2-litre normally aspirated V-10 lump powering the Audi's, since after all their owned by the same company, i.e. ; VW. As GRT Grasser Racing with its No's 11 & 19 and Paul Miller Racing #48 will hope to run wild over the GTD field. Longtime Sports Car entrant Riley continues their latest project with Mercedes, campaigning the AMG GT3 normally aspirated 6.2-litre V-8 Audubon cruiser, once again sporting the No. 33 and apparently the #75 SunEnergy1 concern. With a new team called P1 Motorsports running the #71 Merc' GT3 racecar. 2018 ROLEX 24: Ready, Set, G-O! ROLEX 24: Does Qualifying really Matter?